I am currently sitting next to our Christmas tree, which is covered in everything from traditional Czech figurines to glass angels and tacky glitterballs. In the last few days I have (to adapt a quote from Alice in Wonderland) eaten much too much of a (good) muchness, now have a new book collection and enough art materials to keep me going throughout the year and several vintage items of clothing and accessories ready to style for my blog. Unfortunately both my parents were pretty ill on the day itself, but we made the best of it and still spent many hours with very good family friends. So, in the spirit of the holidays, I thought I'd post a vaguely festive looking outfit. You may have seen this red dress once already here back in July, proving how versatile it is whatever the weather. I bought it from a charity shop in Bristol a while ago and it has been incredibly useful in these chilly temperatures. I love the sixties silhouette, so decided to do a full on Twiggy with a thrifted Zara polo neck and a vintage brooch from my paternal grandmother. The furry hat is from Kangol - that classic label has been popping up all over the place in my hat collection. Kangol, you are officially my new favourite brand (alongside Jaeger). I 'appropriated' the black leather boots from my mum, and the very beautiful charm bracelet was given to me by the wonderful Pearl as part of a 'get better' package I recieved while recovering from surgery in hospital. It is festooned with little russian dolls and tea pots, and reminds me of a Tom Binns piece. Thank you so much Pearl! 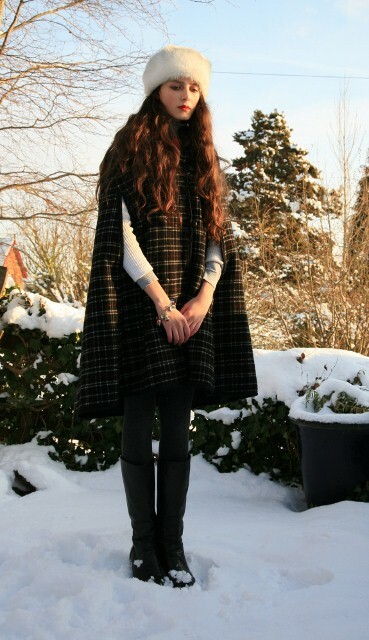 Now, it being winter and all, my favourite outfits tend never to be seen outside as they're hidden under lots of layers. But here this thrifted cape was the perfect final touch. It's reversible, meaning I will probably post the grey tweed side at some point too, and cost the hefty sum of £2.50 from my favourite local charity shop! There's also a Jaeger white cardigan underneath that belonged to my Great-Grandma. The day I wore this my family and I met up with lovely Jill for a scrumptious lunch and some quick photos before having to cut the visit short as my Dad was feeling ill. So you might see it popping up on her blog soon too! The location was an (ahem) ever so glamorous corner of our garden. My back was hurting and I didn't want to walk anywhere in the ice. Luckily, as I mentioned in my last post, snow manages to make everything look more picturesque. Among some of the favourite books I recieved for Christmas were: an Alexander McQueen book I had been lusting after, Style Book: Fashionable inspirations (which I heartily recommend to anyone who has a love of either fashion or photography), a book on the role of Vogue during the second world war, a french Van Gogh title, a novel called 'The Vanishing Act of Esme Lennox' and an illustrated copy of Cider with Rosie. I hope all of you who celebrate Christmas have had a happy, warm and festive season filled with good things. Sounds like you got some great presents, happy christmas!! I love the 60s look! These are gorgeous photos. I love the versatility of that dress. It's all in how you style it. Can't wait to see your new vintage finds! seems you received some wonderful gifts for christmas! Unfortunately I can empathise with your parents but equally it did not spoil my Christmas! 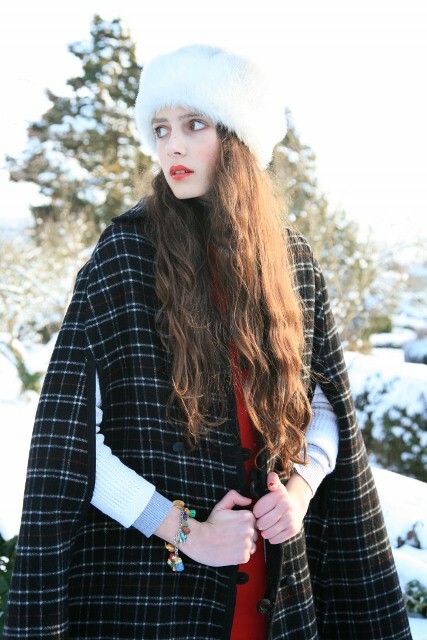 Beautiful shots; the hat and cape are divine! Ooooh, what was the book about Vogue during the Second World War called? Sounds really interesting! Lovely dress; it really stands out against the snow. Sadly most of the snow here is melting, and we got very little in the first place. So nice outfit! Hope you had a great Christmas time! you're stunning! love these pics! hope you had a fab christmas! You are beautiful,elegant,just like old cinema actreses.Congratulations for your blog. Kisses and hugs from Madrid. I love your cape! Can't believe you paid only 2.50 pounds for it!! I love you in your wonderful red dress and cape. Nice to know that you are enjoying Cxmas,apart for the ill spells. You look beautiful in red. And with the cape . . . breathtaking! Sounds like you had a lovely Christmas dear! I love this festive outfit! The poncho was a really amazing buy, it's so classic. It sounds like you got some great reading material. I will have to check out those books. That's a really great cape! It seems perfect for jumping around and prancing and frolicking :). You look really nice in bright colors! I do love a good cape, have you seen the Incredibles I watched it yesterday and there is a really funny part where it explains the dangers of super heros who wear capes! My whole family and I have been stuck with the flu all over Christmas so its been very quite for us. £2.50, what a major bargain! Love your red dress too, isn't it great to find something that will do as well for winter as summer. I hate having to pack clothes away for an entire season. The book haul sounds amazing - especially the illustrated Cider with Rosie. Hope your folks are feeling a bit better now. It is a rotten time of year to be ill, but it seems as though lots of people were suffering on Christmas Day this year. nice photos, u look beautiful! These pictures are absolutely stunning! I LOVE the red dress!! I love your outfits as per usual! Hey sweet pea, just running out and realised I didn't even tell you I've got another post with you in it up! In the same gorgeous outfit. More later - sent your mom the photos but I'll send them to you too soon as I'm back. It was LOVELY seeing you - far too short - but hope your dad (and your mom) are feeling better & now we know how easy it is we'll see you very soon. Great outfit.I love it. The hat is adorable. Can tell me the name of the book that is about Vogue and the second world war?? You have such a wonderful blog, and you're only 15! That is amazing me to me. You have such a great eye and talent for vintage! Beautiful outfits, too! I love the green brooch! Such a nice little touch! You look soooo marvellous in red! And the cape is lovely! I'm new here, found your blog through the Citizen Rosebud and I absolutely love your photography, it's stunning. You look absolutely gorgeous here.